Distributors aren't really employees or customers -- they're more like partners. Here's how companies can get the most out of these crucial relationships. Many supplier businesses have trouble getting a handle on their relationships with the companies that distribute their products or services. That's because these distributors are like employees -- or salespeople -- in some ways; they're the outlet through which the supplier reaches the marketplace. 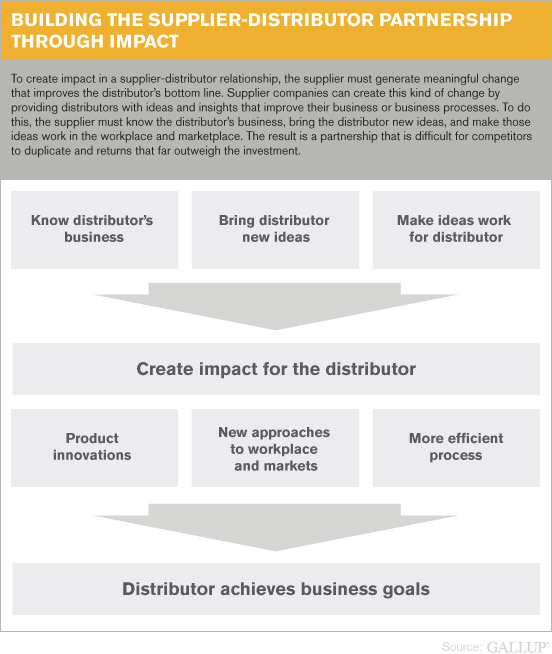 How should suppliers treat distributor companies and their employees? Like employees or like customers? Which is it? For example, the distributors for an insurance company are the insurance agencies that sell the supplier's policies and coverage. For a beverage company, the distributors are wholesalers, who sell to a retailer, who in turn sells the supplier's product to the end customer. And for an automobile manufacturer, the distributors are the dealerships that sell the supplier's cars to consumers. But distributors often have extremely demanding requirements, much like customers do. If suppliers don't meet their needs, the relationship will falter. So how should suppliers treat distributor companies and their employees? Like employees or like customers? Which is it? Gallup gets these questions from supplier companies a lot. Our research in several industries -- including the insurance, medical devices, consumer packaged goods, financial services, and automotive sectors -- reveals a nuanced answer: You must treat them as if they are both. 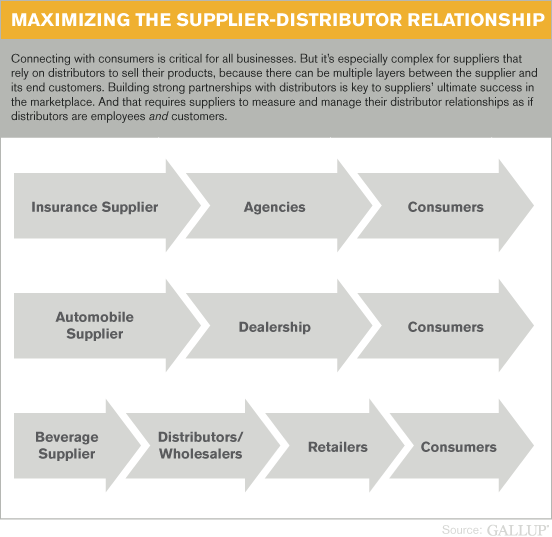 More importantly, in the most effective supplier-distributor relationships, suppliers don't view distributors as merely employees or customers -- they see them as partners. The research also shows that measuring and managing the supplier-distributor relationship can optimize distributors' performance. Before that can happen, though, suppliers must overcome two difficult challenges: managing their brand when they reach customers only through a third party and recruiting and retaining talented people on another company's staff. All companies face the second challenge -- attracting, recruiting, and retaining strong talent. But again, it's an even bigger problem for supplier companies because they don't have direct control over the distributors that represent their products or services. They also have limited ability to ensure that top performers are assigned to their account and that these distributors are properly managed. For suppliers, distributors are the face of your company. They either accentuate or cloud your brand promise. Building a partnership at this level takes extra effort. But the performance results can be well worth it. A Gallup client found that distributors with high employee engagement delivered 1.4 times more revenue than the average distributor, and those reporting high employee engagement and high customer engagement outperformed others by more than $200,000 per distributor. Obtaining that premium depends on carefully managing three things: engaging distributors, engaging end customers, and selecting the right representatives. Engaging distributors: Gallup's work with some of the world's best companies has shown that businesses that achieve high levels of both customer and employee engagement, which Gallup measures together as HumanSigma, gain exponential financial impact. When used with suppliers and distributors, HumanSigma acts as a partnership meter: Distributors that are highly engaged when measured as employees and as customers are happy with the resources the supplier provides -- resources that help them run their business more effectively and that help them succeed in the marketplace. When problems occur in the relationship, measuring and understanding the drivers of both customer and employee engagement can pinpoint specific actions the supplier can take to fix them. Engaging end customers: Feedback from end users provides a wealth of information about their engagement with the supplier's products or services. This feedback also provides key insights into problem incidence and resolution, wallet share, and intent to repurchase. Distributors that consistently underperform are most likely not executing on the supplier's brand promise, quality, or service, while partners with outstanding performance are more likely to see future sales increases. Evaluating and forecasting distributor performance is often difficult, but asking for end customer feedback makes it much more accurate. Selecting the right representatives: The distributor's salespeople serve as the supplier's brand ambassadors, so a supplier should be very concerned with its distributor's salespeople. Offering distributors tools that make it easier for them to hire better salespeople and sales managers is an excellent opportunity to build partnerships. For suppliers, distributors are the face of your company. They either accentuate or cloud your brand promise with your end customers. Building real partnerships with distributors, however, makes the supplier's brand promise vital to the success of suppliers and distributors. That partnership can improve both organizations' sales and performance -- but it can also serve as a profound differentiator in a crowded market. To begin building this partnership, suppliers should act as though their distributors are already partners: Know their business well, give them tools that are proven to improve their performance, and help them reach their goals. Create structure to capture and share best practices from the field. 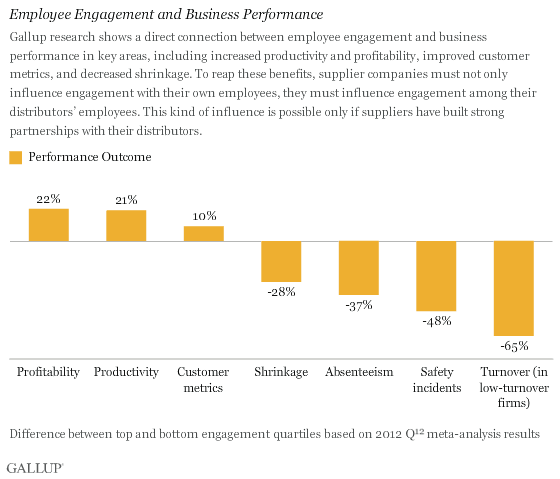 Actively managing customer and employee engagement boosts results in any organization. Measure what matters, and engage employees, distributors, and end customers -- and as the bad ones fall out, replace them with the best. This partnership is good for a supplier company, its brand, and its earnings. But it's just as beneficial to the supplier's distributors. As the supplier's revenue increases, so does its distributors' revenue. As one of our client's distributors said: "Help me become a partner, and together we will succeed."